I came across this great article on the BBC culture site about the history of wallpaper – did you know it used to be an offence punishable by death to forge wallpaper in England? And how did people allegedly die by wallpaper? Have a read and find out! Unfortunately the event at the V&A it was associated with has passed, but it seemed a good excuse to remind, or inform, you all that London Met Special Collections has a selection of wallpaper samples that can be viewed in the Reading Room, (you are advised to contact them beforehand as they would need to be bought up from the store. External visitors would need to make an appointment ). Information on visiting the Special Collections is here. There are some beautiful samples of William Morris designs hand printed by Sanderson, and if you want to get up close and personal with some seventies/early eighties embossed wall coverings, there is a whole big book of them by Crown Relief Decorations. 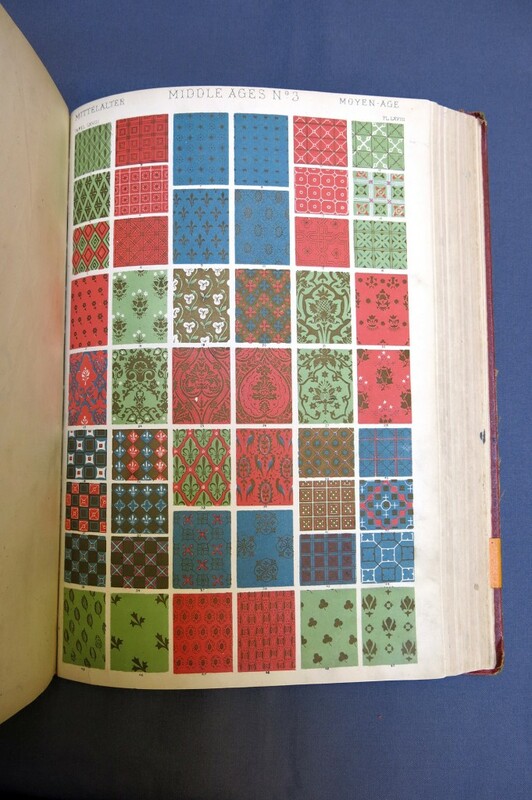 As well as the actual wallpaper samples, there are many books that are old, unique or rare on art and craft subjects relating to the history of the CASS in the Special Collections. 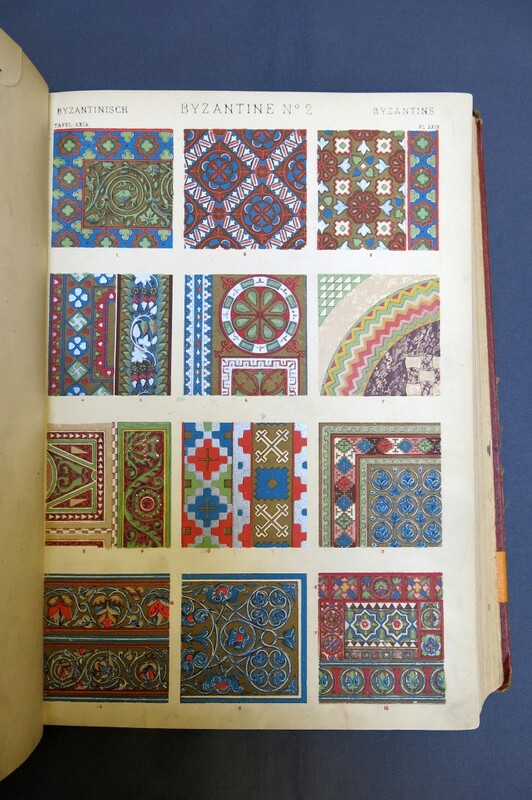 This includes design and interiors, such as a 1910 edition of ‘The Grammar of Ornament’ by Owen Jones, some pages of which are depicted below. The Museum of Domestic Design and Architecture (Moda) at Middlesex University, also holds a large collection of wallpapers, dating from the late nineteenth to the mid-twentieth century. Viewing is by appointment only, please contact them before visiting. You can view some of their collection online via their catalogue. There is also the V&A, which has an abundance of information on wallpaper here. And don’t forget the Materials and Products Collection, on the third floor of Aldgate Library, where you can browse material samples of products including more current wallpaper designs! This entry was posted in Archives, art collections, External archives and libraries, Special Collections and tagged "interior design", design, Special Collections, wallpaper. Bookmark the permalink.